While I got it when it was new, I am just getting around to building this kit. Had to take a break from rigging my Lord Roberts. Looks like it will not be a real break, however. Painting this thing is going to be at least as bad as rigging the Roberts. 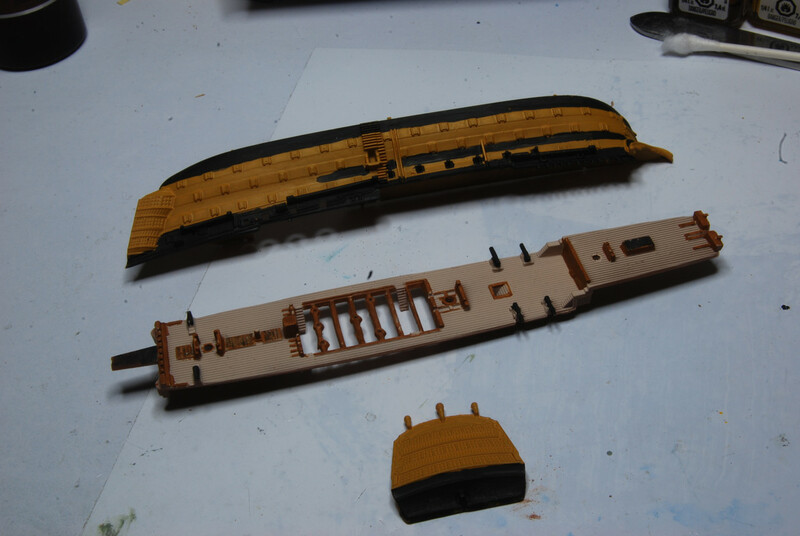 I started by airbrushing the ochre on the hull sides. I thought I would be able to paint the black stripes freehand. That is just too hard! But masking the ochre along the gunports is very hard too, with the small size of this thing. However, that is now my approach. I used to love the 1:600 kits from Airfix and Heller, and built quite a few. Still have a couple in my stash. I thought this somewhat larger scale would merit a bit more detail than what I put into those 600s. I did purchase some PE shrouds and ratlines. Only thing I don't like about the kit so far, is that the deck below the open waist is just structural. Even though it is visible the kit has no detail whatsoever. I am thinking of printing up a piece of cardstock to make an applique for the deck with inked lines. We'll see how that goes. Detail in the molding is fabulous. The kit gives you the option of full hull or waterline. As you can see, I am taking the waterline option. Don - Nicely done so far. 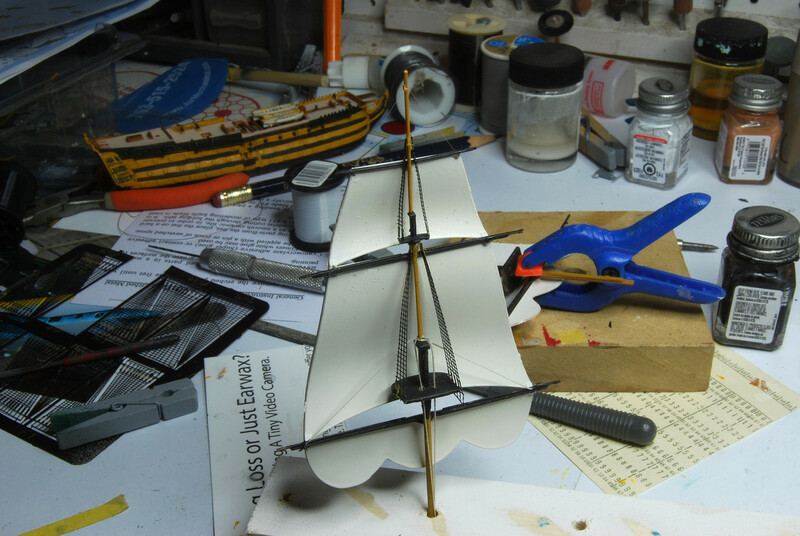 I found it really difficult to work with on a 1:350 scale ship, so I am amazed with someone who works in smaller scales. Compliments to the chef!!! got the hull together now. The two halves of the main deck did not meet, leaving a big crack visible. There are a bunch of boats that are stowed above, so I am hoping the crack will not be that visible. I'll test fit them and see how it looks. Boy, there is a tremendous amount of brush painting on this thing. 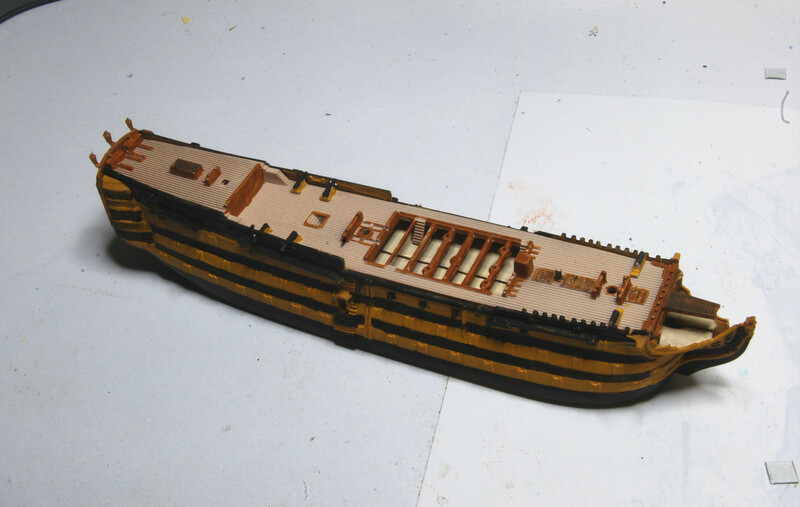 Only airbrushing was a main coat of ochre on the hull and masts and beige on upper decks. All black and dark brown is hand paint. Using toothpick point for much of the really fine painting. Don, it looks great & your painting is greater. I am fired up on Victory's & bought another Airfix the other day. I think it was you that reminded me to coat the edge of my masking tape with, I use clear testors lacquer. I used to do that all the time, but forgot about it. Did you mask it? Or are your hands still steady? I masked for the black stripes along the hull, but that is all. The deck details were all handpainted, as is all the fancy work at bow and stern. I also use the point of a double-ended sharp toothpick to do the finest detail, and used a black wash over windows on the galleries. Here is the mainmast, with the plastic sails, ready to mount into the hull. Note the Atlantic Models PE shrouds and ratlines. There are little pegs on the masts that are supposed to fit intobosses with holes molded into the sails. The peg for the topsails, however, are out of place on each of the three sets of sails. I just filed off the peg, filed the yard clean of paint and glued the yard right to the boss. The pegs for the mainsail and the gallant were in the right spot and did mount pretty well. Don, that is really a little beauty. I might have to try one, but I am kit heavy right now for nearly 88. Have you heard anything from BILL, warship guy, ? really nice job on this build don . the PE look's pretty good . I haven't heard from bill in age's either gene . BTW, I also have a pretty good stash of ship kits. However, as age bothers my manual dexterity (cataract surgery fixed my eyes), I figured I'd better adapt the old philosopy of use it or loose it. I used to love those old Heller and Airfix 1:600 kits, and have a couple of those in the stash. But when I saw this 1:450 kit, I thought it might be a way to ease back into smaller scale without going bonkers. That is a nice little model you are making, Don. How big is it, or rather, how small is it? 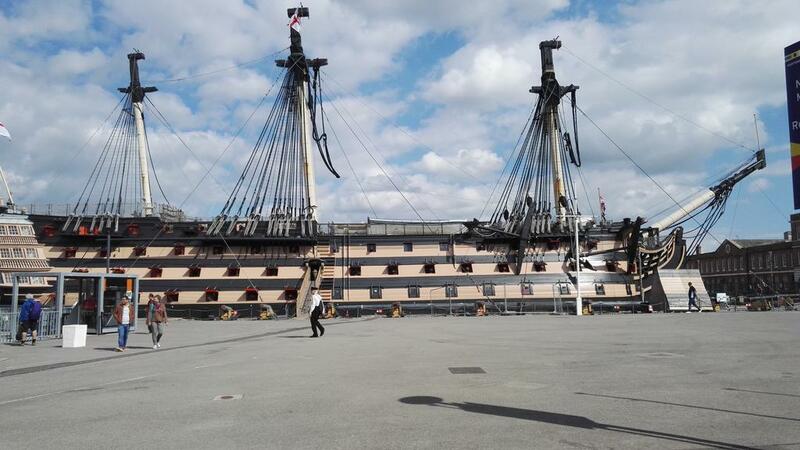 I live in the south of England and I'm planning to go to Portsmouth this Friday, to see the Naval Dockyard and go aboard HMS Victory. I have been once before, many years ago, time to renew the acquaintance. That's looking good Don. The PE shrouds look pretty good. Look forward to seeing this finished . You'll keep going for a long time Don, take it from somene that knows. Model building really does give you a shove. I think the PE shrouds look great & if 227' divide by 450 is only 6" that is a little boat & a super build. How long is the hull alone? You said you use Postimage? It looks great & I finallgot my Whaler pictures to print. Building these things does keep you happy for a long time, I'm hoping for at least 90. I run up & down the stairs to build models at least 6 or 8 time a day. The hull is six inches long. Haven't measured it with bow sprit in place. BTW, as displayed now the ship has black gunports. I fear painting those, so I have found in other eras it had the ports the same color as the ochre stripes, so that is the livery I have chosen. Got all the sails attached to masts, and mast pre-rigged with rigging on upper sections. Also got the bowsprit and jib boom assembly in place. 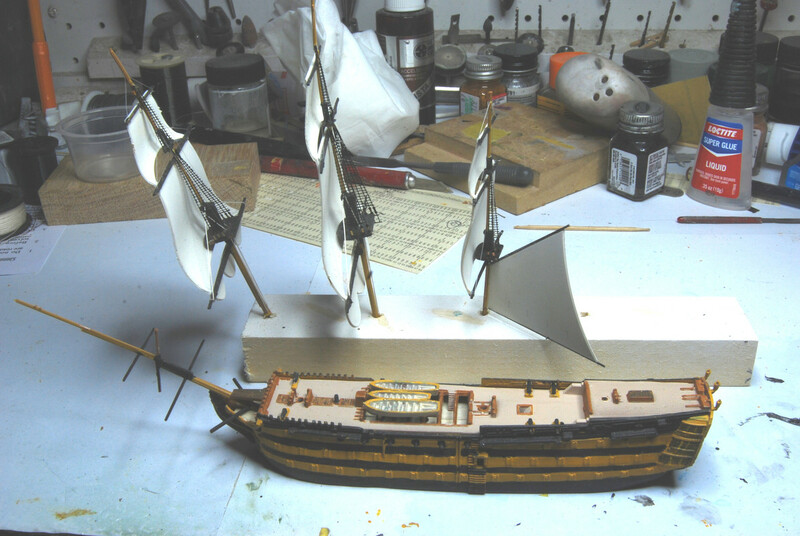 I will do some rigging on the jib/bowsprit area before I put the masts in hull. this is going to be a really nice model don , 6" long , you must have a really steady hand mate . I was under the impression that the gun ports should be ochre anyway (ochre on top, black underneath). I don't know why they're painted black on the ship these days. I thought the whole point of the Nelson chequer was that when the gun ports were closed (just showing stripes) it signalled no intention of battle (handy in friendly waters) and that when the gun ports were open it reveled the 'chequer' pattern, and the intention of conflict. No? No... the port-lids were black on the outside, giving a sort of checkerboard appearance when closed. From what I've read, the whole point was to be able to signal intention over a distance. Much like how in nature animals use their colours to signal hostility. If the gunports are painted black, then it looks as if the ship is constantly in battle mode. As I understand it, whaling ships painted a white line with black squares along the hull to make seem as if the ship was armed. But surely anybody would've known that a ship of Victory's size was going to be armed to the teeth, why fake it with paint??? Signalling intention could be used in all sorts of ways to either bluff the enemy, or to let nearby ports know that no harm is intended. Here's a little diagram I just knocked together in Photoshop to illustrate my point. Famously, the Charles W. Morgan had painted gunports, but only in the very last years of her service. The idea there would be to ward off pirates or other malcontents in far off waters, but not to appear to be a capable warship. Don, I can certainly see where at 1/450 that would be quite a challenge. Looking good Don! Way too small for me! Would love to see the Victory! I was there yesterday. She is an amazing sight. The ship is in the middle of a major restoration effort, everything above the lower masts has been removed to storage so it can be restored and preserved. I don't know when she will be fitted out again. I think the masts are supposed to be finished in the next few years (they're up at Chatham for now) but there is concern over the weight of them. I wonder if in the future there may be a glass dome or something enclosing her to prevent the destructive rain water. Amazing place isn't it? Warrants a couple of days visit to see everything. @Mark Carroll There's a good GoPro 4k tour on YouTube if you can't get there. I visited her in May 2015 and she look now like she did then. Amazing ship to see and to see how she was built. When I was below deck the tour guide was enjoying himself telling me how the keel was made from stolen American southern oak. I sure maybe in the past but now they most likely buy it from us now. He sure did enjoy telling how much stolen American hardwood went into building her. RE:" He sure did enjoy telling how much stolen American hardwood went into building her." He better get his history straight. The British Empire "owned" America (the 13 Colonies) when HBMS Victory was being contemplated. So, if any wood was ever brought from the Colonies it was not Stolen. I have not found proof that any American wood was used to build Victory. Wonder where he got the idea. In my readings I have found reference to "90% of the timber used was oak mostly felled in the forests of Kent and Sussex", and some "straight oak" was imported from Gdańsk. Reports are the wood for Victory had been seasoned for 15 years prior to Victory's building too. That is not such a good "story" for the tour guide to tell to the younger visitors. I like tour guides, especially with a bit of salt. Thanks for the insight from 2015. Your Picture of the Victory with an IBM 80 column card in the background was a delight. It brought back memories of when I was so busy working 12 hr days I couldn't think of getting back into this hobby. I have this model too. The kit dates from 2016, (a new Mold!) 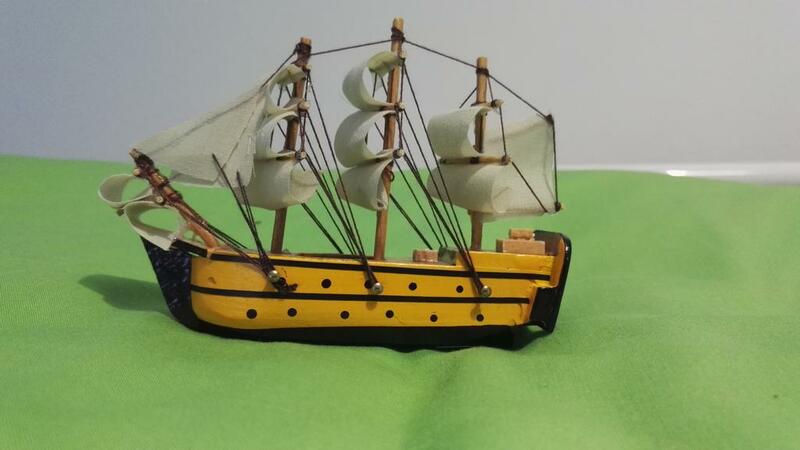 ,and is a nicely detailed little model... except for the lower hull. They sure screwed that up. Warship Guy and I both have the kit and until you showed such a great effort in painting and assembly, I was going to relegate it to a Ship-in- a-bottle, where the distortion of the glass would hide the lower hull. Thanks for this waterline beauty. You are looking real good and I will be following to see what you discover while making your Victory. And, will you try a fine-tip marker for the gun ports? No, I have decided not to paint the ports black. During most its service life, I believe the ochre stripes were continuous, with the ports ochre. That eliminates a lot of work. Got the foremast and mainmast in, and the standing rigging for them in. Boy, PE shrouds and ratlines sure look nice. 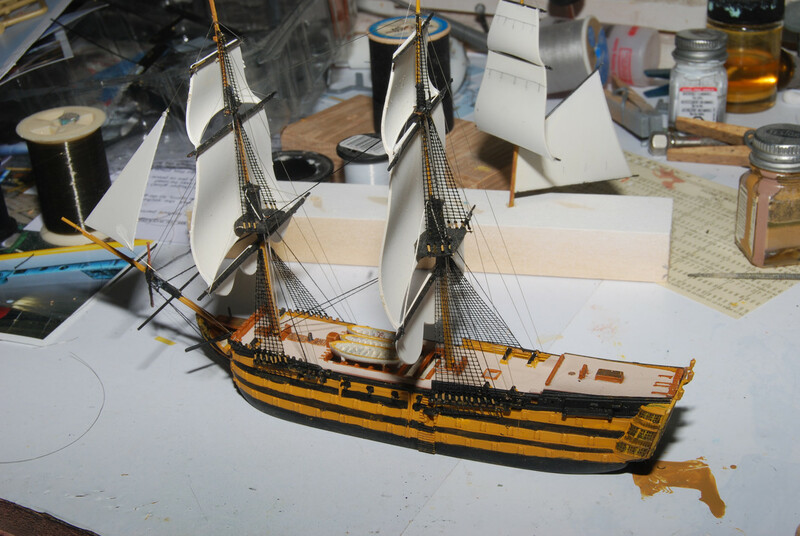 A suggestion for any kit mfg offering sailing ships- please consider PE shrouds and ratlines, especially for smaller scales. You are overthinking it methinks. If you want to signal anything you use flags, it's what they are there for. Masts are visible way before you can see the hull. 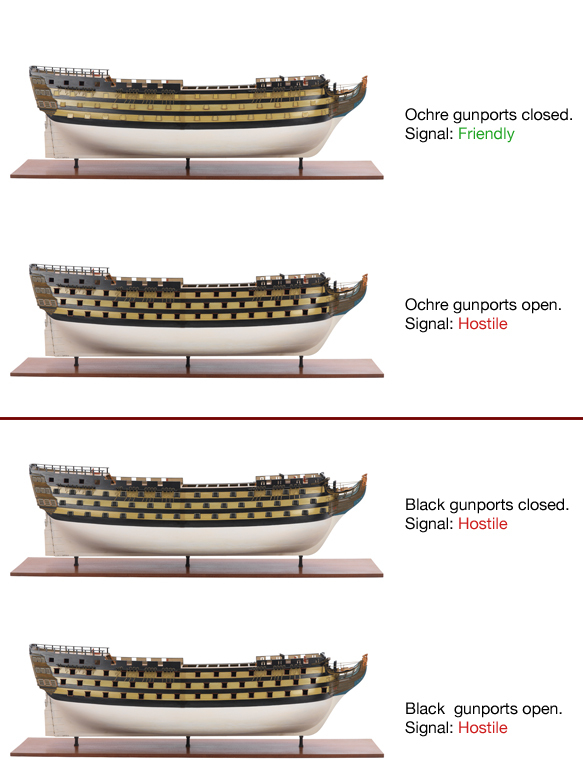 Besides, opening the ports and running out the guns can be done very quickly so a "friendly" signal as you suggest would be largely meaningless. That is not to say that some ships here and there did not use the "checker" style before Nelson, but the most usual practice earlier was to have the outside of the ports in the same - usually a brown or buff - color as the surrounding hull, as per your first picture, maybe with black wales and upperworks and maybe not. Look at paintings and models from the 1600s and 1700s and this is what you tend to see. One should keep in mind that the painting of a ship was largely left up to the tastes of her captain and first lieutenant, within the limits of what the King was going to pay for which wasn't a whole lot. The slight problem here is that she was rebuilt quite a bit in 1801-1803, this included full replacement of bow and stern decorations which substantially changed her looks. And once she was out of the rebuild Nelson got her and probably had her checker-painted to his taste, so it is unlikely that she had the "old" style of paint for any time, if at all, in her post-rebuild state.